AQA Law is the only set of resources to have been developed with, and exclusively endorsed by, AQA, making them the first choice to support the new AQA specification for AS and A2. With a range of truly blended resources, AQA Law offers complete coverage and support through a variety of printed and electronic media. By working closely with AQA , Nelson Thornes have produced resources that will give students and teachers all they need to work through the specification with complete confidence. Learning Objectives, clearly referenced to the related statements in the AQA specification, let students know exactly what they’ll need to learn and understand in that topic. Key Cases are highlighted within the text with feature in the margin summarising principle decisions and outcomes. Examiner's Tips provide essential advice from examiners on common errors and exam preparation. Summary questions promote independent learning and develop students' exam techniques through practice, preparation and examiner tips. 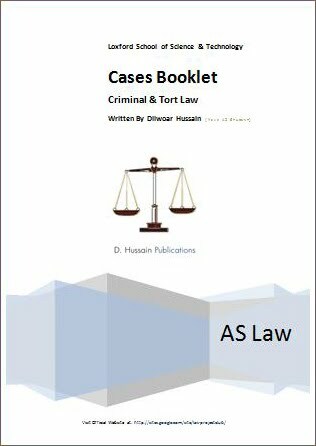 This booklet has all the cases need for AS Criminal & Tort Examination. This is one of the finiest revision guides yet to come to the Educational Market. This booklet has been recommended by many students and also by the Loxford 6th Form Law Department.